8Remember the sabbath day, and keep it holy. 9For six days you shall labor and do all your work. 10But the seventh day is a sabbath to the LORD your God; you shall not do any work — you, your son or your daughter, your male or female slave, your livestock, or the alien resident in your towns. 11For in six days the LORD made heaven and earth, the sea, and all that is in them, but rested the seventh day; therefore the LORD blessed the sabbath day and consecrated it. 13The Passover of the Jews was near, and Jesus went up to Jerusalem. 14In the temple he found people selling cattle, sheep, and doves, and the money changers seated at their tables. 15Making a whip of cords, he drove all of them out of the temple, both the sheep and the cattle. He also poured out the coins of the money changers and overturned their tables. 16He told those who were selling the doves, “Take these things out of here! Stop making my Father’s house a marketplace!” 17His disciples remembered that it was written, “Zeal for your house will consume me.” 18The Jews then said to him, “What sign can you show us for doing this?” 19Jesus answered them, “Destroy this temple, and in three days I will raise it up.” 20The Jews then said, “This temple has been under construction for forty-six years, and will you raise it up in three days?” 21But he was speaking of the temple of his body. 22After he was raised from the dead, his disciples remembered that he had said this; and they believed the scripture and the word that Jesus had spoken. A Supreme Court Judge in Alabama, Justice Roy Moore, put a huge monument of the Ten Commandments up in the Alabama Supreme Court building. There was a huge brouhaha about it, because a federal judge ruled it had to be removed, and he refused to do it, and Justice Moore was eventually removed from the court because of that. Well, as a student of the Bible, I beg to differ. I don’t think he gets what the Ten Commandments are really about. Traditionally the Jews do not call them the Ten Commandments which in Hebrew would be Aseret ha-Mitzvot. Instead they are called Aseret ha-Dibrot, the Ten Sayings or the Ten Teachings. In other words, they view these, not as part of a law that we are required to keep, but as words of wisdom that lead up to a fuller life. So as we approach the Ten Commandments (or Ten Sayings) this morning, don’t think of them the same way you might think of tax laws, or zoning codes, or anything like that. These are a teachings to help us live our lives in a fuller, more enriching way. And within Judaism there is a richer, fuller understanding of them. There is a tradition in Judaism that when Moses went up on Mount Sinai to receive the law, the mountain rose above the people. The early rabbis took this literally, and debated what that meant. One rabbi said that the mountain hovered over the people as a warning. If they refused the law, God would drop the mountain on them, kill them all, and start all over again with a new set of chosen people. 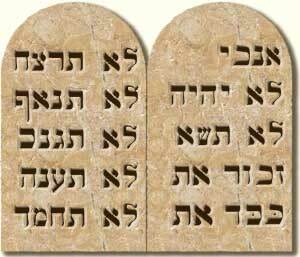 And this is how the Jews traditionally understand what we call the Ten Commandments. They are not an example of laws that govern a nation. They are teachings that bring us closer to God. Look at how they start. God has chosen us. Going back to the whole idea of marriage, we come under the wedding canopy because God has chosen us, and we have chosen God. It would not be much of a marriage if I came home with a new girlfriend. As a matter of fact, I am pretty sure the marriage would be over very soon! But I chose my wife! I do that every day. A long time ago, I accepted the fact that God had chosen me. For me, that was an explicit choice. I made a definite commitment to God. It’s not that way for everyone. For some people it is a life-long relationship. They cannot remember a time when they had another God, or no god in their life. How we come into this relationship with God is not what is really important. How we maintain that relationship is very important. And part of maintaining that relationships is to be faithful to the God who has chosen us. Now I have studied other religions. I have books on Buddhism and Hinduism and Taoism and Islam in my office. I find that interesting, and I learn things about my faith by studying other faiths. While my wife is my best friend, I have other friends. But my relationship with them is very different from my relationship with my wife. So my relationship with other religions is very different from my relationship with God. My commitment is to God. That can never be a strong commitment if I am always wavering between the God that chose me, and other gods. The great thing about an idol is that you can make it be whatever you want it to be. An idol is a small thing, and you can easily manipulate it. I want a god who can make me rich, so I find an idol, one that I can control. That is not a relationship. We all have an image of what we WANT God to be. God is not always a proper English Gentleman. God is not always a conservative, right winger. God is not always a progressive liberal. God is not always a proper Presbyterian who does all things decently and in order. God is bigger than all of these categories, and when we shrink God down to any category like this, we have turned God into an idol. You know, when we first meet other people, we form a first impression. We get an idea in our heads of what they are like. But in most cases, most people are much more complicated than how we see them. I know that when I met people, and they find out I am a pastor, they have an idea of what a pastor must be like. If they get to know me, they will find out what I am like, and how I am both like and different from their idea of what a pastor should be. When we get into relationships, we have an idea of what are friends are like, even of what our spouses are life, but at some point we need to let go of those ideas, and let them be who they really are. If we want to have a mature relationship with anyone, we have to learn to let them be themselves, and not expect them to conform to our idea of what they ought to be like. In the same way, if we want a mature relationship with God, we have to let God be God, and let go of our ideas of what God should be like. I like the way this is worded here. The traditional way I have heard it is that we don’t take the Lord’s name in vain. For years I thought all that meant was that we don’t use the words “God” or “Jesus” when we cuss. I learned it was much larger than that. When we use God’s name to back up our own ideas and opinions, we are taking God’s name in vain. When we back up our own prejudices by referring to God, we are using God’s name wrongly. Whether we are talking about Health Care, tax cuts, or gun control, when we pull God over to our side, we are using God’s name in vain. When we use God’s name to make a buck, we are misusing the name of God. When we use God’s name to win elections, or get more business, or to impress our friends, to make us look better, we are using God’s name in vain. But I am not God. If I take a day off, the universe will remain quite unaffected. The country will be fine. The church will not fall apart. It is only when I become a legend in my own mind that I start to think no one can do without me. A time of rest reminds us that the world can function quite well without us, and that should come as a relief. Now I am not going to go over each commandment. I could probably do a whole sermon on each one, but we don’t have time for that. The first few commandments are about our relationship with God. The last are about our relationships with each other. Now that makes sense. When my wife and married, we both had children from previous marriages. Our children stood up with us at our wedding, and one of the things that was and is important to us is that we treat each other’s children well. We accept them for who they are, and care for them. In the same way, God has many children, and the second part of the commandments tell us how to treat God’s other children. Don’t kill them. Don’t cheat on them. Don’t steal from them. Don’t lie about them. And don’t waste your time wanting what they have. Focus instead on what YOU have. I want to end with one more example about how these are not laws per se, but teachings on how to have a full life with God. Today’s Gospel lesson seems to have little or nothing to do with the Old Testament reading. And at first I was just going let it. But I started thinking about it. Why was Jesus angry at the money changers? Well here is the way the system worked in the Temple. If you brought an animal for sacrifice, it had to be a pure animal, without blemish. Well, imagine you dragged a cow or a goat or a lamb all the way from Mesopotamia to make your sacrifice, only to find when you got to Jerusalem, that your animal had a blemish, and could not be sacrificed at the Temple. Most people, even those that lived in the neighborhood, didn’t want to risk having their sacrificial animal rejected, so they just bought an animal, guaranteed to be without blemish, from the Temple. Now here is the catch. You cannot use secular money at the Temple. You had to change your secular money into Temple money. That is where the moneychangers come in. So essentially, the law requires a pure sacrifice, which makes sense. The intent of the law is that you should be giving your best to God, not your worst. You don’t sacrifice the sheep that you were already going to get rid of. It’s not a sacrifice if you are getting rid of something you don’t want. When you give a gift to God, it should be a good gift. That is the intent of the law. But a few people saw a way to make money off of the law. They used it for their advantage, and that is NOT the intent of the law. Jesus said that the Sabbath was made for people; people were not made for the Sabbath. In the Sabbath Saying, about resting, it says that EVERYONE should rest. That is NOT so we make sure that no one has any fun. The intent of that is that it is not fair for the landowner to take the Sabbath, and then make his family or his servants work that day in his stead. That is NOT honoring the Sabbath. Nor do we honor the Sabbath when we make laws saying people cannot have any fun on the Sabbath. People were taking advantage of the law. They were fine tuning for their own profit, and using it to gauge other people. Yesterday at the Presbytery meeting, I was talking to someone who remarked that some people use our Book of Order, our Constitution, as a weapon. Robert Penn Warren said that the American South was the only place that used manners as a weapon, and as a southerner I believe he is correct. God’s word was NEVER meant for us to use to harm others. It was never intended for us to manipulate for our own gain. It is not like the tax code, which can be used to avoid paying taxes by people who have a lot of money. It was meant to guide us in loving relationships. That is why these are not laws. Laws can be twisted. They were almost made to be gotten around. They can be used to hurt other people. These are more like wedding vows. God promises us, and we respond. We don’t use wedding vows to nitpick and get our spouses to do what we want them to do. We use them to express our love for God. These are not laws. They are wise sayings that lead us to a deeper, richer, more spiritual life. And we would be wise to heed them, as they were intended to be heeded.